I should begin by admitting that I’m a longtime fan of Anna Sui’s clothing designs and her entire aesthetic. I’ve been known to haunt the Anna Sui boutique in New York, just to browse the latest outfits (and costume jewelry, and fragrances), and I always admire the shop’s décor. I also enjoy the music constantly playing in the background, which sounds like the mix tapes I used to compile for myself and my friends in the late 1980s. Sui has always referred to rock music as one of her inspirations, and her shop is decorated with posters featuring bands from the Woodstock era through The White Stripes and Radiohead. 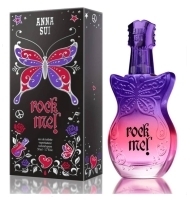 Since she has always combined fashion with these kinds of cultural references, it makes sense that Anna Sui has just released a fragrance described as a “tribute to the electricity and energy of rock-n-roll.” Rock Me! is an Eau de Toilette with listed notes of pear, green orange, and peach skin; honeysuckle, jasmine, and waterlily; and cedarwood, amber, and vanilla. The bottle is adorable, as Anna Sui fragrance bottles always are: it’s shaped like a purple-and-red guitar and embossed with butterflies, stars, and peace signs. If Jimi Hendrix had a granddaughter, she’d probably love displaying this bottle on her dresser. Rock Me! is promoted as a “wild young floral fruity essence,” and it comes across more as pop music than as glam or classic rock. Its personality is expressed pretty well by an animated “Rock Me” video: butterflies release twinkling music notes from a guitar, pixies perform a catchy theme song, peace signs and flowers tumble across the screen, and the model Agyness Deyn makes a few appearances, looking over-accessorized but cheerful. The fragrance itself is also bright and neatly structured. The opening phase is a sherbet-like orange-peach blend, slightly acidic around the edges. Some airy florals bloom in the middle of the fragrance’s development, mostly lily and a mainstream sort of jasmine petal. I don’t notice any pear or honeysuckle, which is fine with me, because those two notes can often feel sticky-sweet on my skin. My favorite part of Rock Me! is the dry-down, when the citrus-smoothie notes melt into an amber-cedar base that feels clean but warm. (When I smelled the fragrance on another woman who was wearing it, I noticed the vanilla more on her than I did on myself.) To summarize, Rock Me! is definitely not wild, it’s youngish but could easily be worn by someone past her teens, and it ends up fruity-woody rather than fruity-floral. Rock Me! lasted longer than I expected for an Eau de Toilette with so many fruit notes, and I enjoyed it, although nowhere near as much as I love the original Anna Sui fragrance (a powdery tea rose) or even the technicolor gourmand Night of Fancy. It’s a bit more grown-up than some other scents in the line (like Secret Wish or Dolly Girl), and oddly enough, it reminds me of Jean-Paul Gaultier’s Ma Dame, which also employed Agyness Deyn as its “face.” I’m always hoping that Anna Sui will release a dark, spicy rose fragrance, or something quirky like a violet-patchouli blend that would better “match” her clothing and her boutique, but maybe I’ll get my wish next time around. 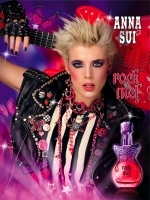 Anna Sui Rock Me! is available in 50 ($58) and 100 ($74) 100 ml Eau de Toilette. It is sold at Target and Anna Sui boutiques. Note: If you’re an Anna Sui fan living in Hong Kong, South Korea, Malaysia, Singapore, or Taiwan, you can enter a Rock Me contest; the grand prize is a trip to New York to attend the 2010 Anna Sui fashion show, something I certainly wouldn’t mind doing myself. I’m sure you’re aware of this Jessica, but Anna Sui is the latest designer doing a line for Target. I’m not sure if it’s available yet or not. Nice review Jessica. This sounds a lot nicer than I expected when I first saw the pictures a few days ago. I expected to hear “more fruity-floral teenager dreck” or some variation of that. Your description sounds more like it’s something nice and easy to wear on a relaxing, casual weekend. Sometimes a girl just gets a taste for something fruity yummy with a vanilla-y dry down …something non-challenging. (can’t wear Mitsouko every day!) I’ll definitely look for this the next time I’m in a Target. Hi Daisy, You’re right, it’s “non-challenging” — definitely not an “intellectual” fragrance a la Serge Lutens or CdG, or a “couture-like” fragrance a la Guerlain or Malle. It’s ready-to-wear, and it’s light-hearted but not air-headed. Reading the notes for Rock Me, particularly all the florals, my first reaction was that it sounded more pretty and sweet than rock-y. I don’t know what I was expecting a rock perfume to smell like. Maybe fresh citrus woody with a patchouli base? A bit of zing and a bit of laid back for after the show? Definitely agree that the bottle is pretty – but again, almost too pretty! Yes, it’s almost like a toy … I will check it out in person, but by just looking at the picture, I can’t imagine it in my collection. Too candy for me. Lsnuing, It’s pretty toylike, and in keeping with some of the other bottles in the collection– the butterfly for Sui Love, the purse for Sui Dreams, the Dolly mannequin heads — but I’m still a sucker for this kind of cuteness! Erm, just read back my above comment – to clarify, I meant ‘Pop Me!’ versus ‘Rock Me!’ in a, you know, Pop versus Rock type way – not in a tweens and their cherries type way… argh! LOL Vickyjane! I didn’t even think of that until you mentioned it! Vickyjane, lol! Gotcha. I understood, but thanks for clarifying. It *is* more pop-rock than full-on classic rock or metal! hmmmm ..so how fast CAN you back pedal?? lol Although I also knew what you meant the first time….but it just got funnier and funnier. ahhh, just gotta love NST for entertainment…. Good review Jessica. I am reluctant to try this-it seems like another fruity/floral sweet concoction, a la Britney. I too like the idea of a violet patchouli blend with perhaps a titch of sandalwood thrown in. Mmmm! Hi Dolly, Fortunately, the Anna Sui girl seems a bit more sophisticated than the Britney girl, hah… it’s sweetish, but nowhere near as candy-like as most of the Britneys. But yes, I keep hoping for something even “darker”…! Great review! Ive always wanted to try her fragrances but could never find them. Ive been dying to try Flight and Night of Fancy! Especially Night of Fancy cuz that just sounds like sweet heaven in a bottle!!! Doesnt it have milkshake in it? Awesome sounding to me thats for sure!! Do you think youll review that one? I need to head over to Target to try Rock Me! Hi Jonr951, I don’t remember much about Flight of Fancy, other than that it’s a somewhat generic fruity-floral, but Night of Fancy is a guilty-pleasure scent for me… definitely on the sweet side, lots of berries and cream. And, you know, I have a feeling that Rock Me! might only be available at Target.com, not in stores… report back to us! well, rats! how are we supposed to sniff it online?? they’d sell more if they’d put it in brick and mortar stores! Good question! Maybe it will be more widely distributed after a few months. Is Night better then Midnight Fantasy cuz they both sound very similar to me? Midnight was berries and cream to me. Ive never smelled it but I know ill luv it. I need to find it online soon!! Well, “better” is always a matter of personal taste! I sniffed Midnight Fantasy when it first came out, but can’t remember it in detail… maybe someone else can help us out here. Yay! Finally a contest in Asia! Ammy, Yes indeed! I get the impression that Anna Sui’s beauty and fragrance lines are extremely popular in Southeast Asia (and the lighter scents are often geared towards those markets/climates? ), so this makes sense. Sounds fun. Firstly, I was attracked to the bottle. Finally I got it as a new year gift when in traveling in HK with my boyfriend. Well, the actual fluit is not quite fitting to the bottle shape and colors but smells lovely as described above. Even though this is not a perfume I would usually wear as I perceive myself very differently, however, it smell very nicely on me. I guess it’s not bad to have something to make you smell..umm…sweetly light-hearted! Eveden, It’s not my usual type of fragrance, either, but I enjoyed my sample! It’s true, everyone needs a perfume that’s just *fun* once in a while. well..hope it’s not like those anna sui typical smell. Want something different from it..